1. Place the steaks in a shallow bowl with the olive oil, balsamic vinegar, chopped oregano, garlic and cracked black pepper. 2. Leave to marinate at room temperature for 30 minutes, or for longer covered and chilled in the fridge. 3. Preheat a griddle pan, and preheat the oven to 200°C, gas mark 6. Griddle the steaks for about 3 minutes on each side, remove from the pan and set aside to rest for 10 minutes. 4. Place the 4 ciabatta rolls in the oven to toast for 5 minutes. Slice the steak and toss with the rocket, red onion, sunkissed tomatoes and pecorino. 5. Split the warm bread and spread with the pesto. 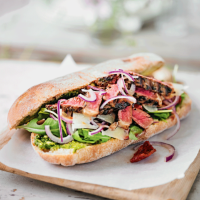 Pile the steak and salad onto the toasted ciabattas, and serve.